Often praised higher than Pebble Beach at half the price, Bandon Dunes’ ocean link courses provide a taste of Scotland without passports. Every course is a rigorous walk enriched with natural dune bunkers carved by God and gorgeous yellow gorse, of course, imported over a century ago from Scotland. Bring your bump and run game as the difference from fairway to green grass is very subtle. Bring too, your camera for some of the best ocean golf views. Thanks to Freeman Theriault, acclaimed with 46 holes in one and John Gunby, PGA Pro, for sharing their Bandon Dunes award trip, and check marking our bucket lists. Our stay was extended at “A Bandon Inn”, Al Greenfield’s golf lodge perfectly created for groups up to 12. Minutes from the courses, with a surreal hilltop view, guests entertain themselves in the theater and poker rooms, or relax on the deck, fireside, where burdens be gone and golf tales be told. Al includes top shelf drinks, gourmet breakfasts, and all the connections you need. He hooked us up at Bandon Crossings Golf Course, a great inland layout with plenty of deer and trees to shape each fairway. Carts there provide a relief after walking the Bandon Dunes courses. In sheet rain, and high winds, we previewed the new, Old MacDonald course, with caddy Dan who warned against umbrellas. By the second tee box it was folded du ring the drive, yet a gust launched it skyward. A 100 yard dash just saved it from blowing over a cliff. Caddies know. Since the ladies’ tees were yet unmarked, we fancied ourselves as Pete and Alice Dye, selecting the optimum platforms. Designer Tom Doak studied with Dye and created gargantuan greens here, averaging 15k square feet! Speaking of ladies, they are conspicuously missing and since they are most welcomed, female golfers should take note and enjoy this beauty. A journey along the coast indulges senses with a symphony of sea lions barking, waves crashing and whistling wind along with dramatic cliffs and monolithic boulders. Downtown shops carry souvenirs and cranberry delicacies, grown in the local bogs. At McFarlin’s restaurant, partake of a menu set to a different tune, all in the best key and service to match. Closed only on Christmas, Bandon Dunes is surprisingly a year round destination. The Oregon Trail may begin at any airport. 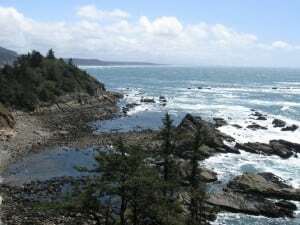 We chose Bend/Redmond and followed the McKenzie River to the Bandon coast, passing rugged mountains, sparkling lakes, and falls, where elk, and sheep were oblivious to the early May snowfall. Returning to Bend along the Umpqua River, Crater Lake, the second deepest lake in North America, formed by a volcanic eruption, with snow banks 15 feet high, and the boldest blue water, was a natural phenomenon to behold. The mountain range conceals other active volcanoes. After Iceland’s recent activity, it makes you wonder what may come. Neither rain nor snow will keep us from our appointed round. With many courses to conquer in Bend, Crosswater offers the best of the private membership amenities at Sun River Resort. It is home to the Jeld Wen in August, to a nest of eaglets in May and greenside on hole 11 is the permanent home or grave site, of the pioneer Allen family. As the only crazy golfers, playing in a snow storm, it was an unforgettable round. Oregon is truly a sports person’s paradise with skiing, kayaking, golf and some of the finest trout/salmon fishing of the west coast. The views are breathtaking, rain or shine; just pack for both. Create your own outward bound adventure and enjoy!